Ben Lively doesn't get mentioned much in this post, but at least we have his picture! 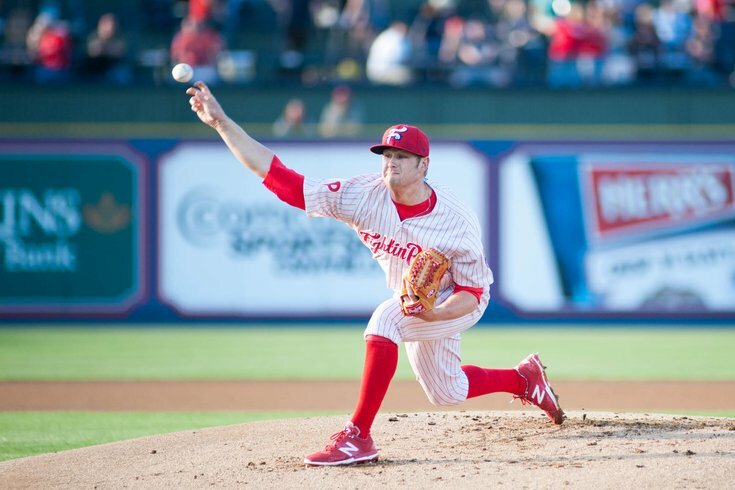 With the Phillies firmly looking toward the future out of necessity, the organization’s standing at the bottom of the MLB food chain dictates that coverage of the minor league system is pretty darn important. Heck, to help prove that point, I even spent a whole weekend in Reading not so long ago. That’s a pretty long drive from where I live, you guys! For me, the difficult question has always been what’s the best way to keep tabs on the Phillies’ farm system. We obviously can’t keep up with sites like Phuture Phillies and Phillies Minor Thoughts that provide consistent and excellent analysis of what the Art Charles’ of the world are up to. Still, there had to be a way to differentiate our #brand and give the people what they want (the people that want minor league updates, anyway). After racking my brain for a few days and being unable to come up with anything original, I decided to just rip off Jonah Keri’s format for “The 30” on Grantland. Imitation is the sincerest form of flattery, correct? My reasoning is that people like power rankings, people especially like power ranking baseball prospects, and this way I don’t have to write in-depth about each of the Phils’ top prospects every couple of weeks. Now that I’ve spent enough time explaining how I settled on the format, here’s the debut of “The 8.” Nah, I’m not serious. There’s no name. I figured we’d start the list at eight prospects. There is more quality in the system for sure, but the other players who would get consideration are hurt, underperforming, still have some skepticism surrounding them as prospects, or are waiting for their season to start in earnest. Expect the list to grow in future installments. Look out for the name Franklyn Kilome later this summer. Speaking of guys that are hurt, it’s nice to see that Mecias is pitching again, even if he’s being brought back slowly. From everything that you read about Mecias, he already has two plus pitches in a low-90s fastball (for a lefty, that velocity plays) and an excellent changeup. He came back from Tommy John surgery last year and his stuff wasn’t reportedly where it was in 2013 before he got hurt. Mecias will need to regain that stuff, but his ceiling is maybe a No. 2 starter if he does. Before we get to the Toccinator, a quick update on Eflin, who had a bizarre couple of starts since I saw him in Reading a few weeks ago: He followed up 8.2 innings of four-hit ball (no earned runs either, should’ve been a complete game shutout from all reports) at Portland with three innings, twelve hits, and eight earned runs in New Hampshire. Basically, he went from Cliff Lee to Sean O’Sullivan in four days’ time. His ERA skyrocketed from 2.28 to 3.48 from one start. "We felt like, what we saw from him in Spring Training and all that he accomplished in the fall, that we wanted him to experience success before we put him in a different league. He's done everything that we had hoped he would to this point…He's probably telling us that he needs a new challenge, and if he keeps playing well that's probably coming." The reason why sending Tocci (pronounced Toe-chee) back to Lakewood was a tough decision for the Phillies is that he’d already been there for two years. Like, he’s had more than enough time to hit up the area’s “landmarks” (The Stone Pony, the “Jersey Shore” house,” Seaside Heights boardwalk) and is ready to head to Florida, close where he trained in the offseason. Tocci is sure playing like it, as his batting average, slugging percentage, and on base percentage are all about 100 points higher than they were last season. The promotion should happen fairly soon. Crawford missed all of April because of a strained oblique muscle, but hit .375/.474/.422 with more walks than strikeouts in his first 17 games back from the DL for Clearwater. He's an elite defender with tremendous bat-to-ball skill who profiles as a true leadoff type with his ability to hit for average, get on base and run a little. It should be noted that while everyone considers Crawford an elite prospect, Law has been slightly higher on him than most. Before the season, he ranked the 20-year-old shortstop seventh overall. Kris Bryant and Addison Russell are Cubs now, so Crawford really only moved up one spot. After suffering the injury, it’s not like he’s has done anything to dissuade Law from his original position. Even in a relatively small sample, getting on base basically half the time and playing great defense at an important position should make anyone bullish on his future. As Winkelman notes, there’s very little you can criticize about his approach at the dish. The strikeout and walk rates would both be great on their own, but they’re excellent when combined. It will be interesting to see if Crawford regains some more power if the on-base numbers come back down to Earth a little bit here. The good news for Phillies fans it should be more convenient to watch him play fairly soon if you’re so inclined. I’d expect him in Reading at some point this summer. And why wouldn’t be inclined? They have a thing called “Gluttony Night” a couple of Tuesdays from now that puts the standard dollar dog game to shame.